Good evening, and welcome to this Britten Sinfonia pre-concert event, at which I am delighted to be joined by tonight’s conductor and pianist, Pierre-Laurent Aimard and soloist Tamara Stefanovich. Tonight’s concert, which has the theme Dialogues, is a celebration of the music of the contemporary American composer Elliott Carter who will be 101 in a few weeks time. We will be discussing his music a little later; but first, and rather perversely, I want to talk about a composer whose music does not appear in tonight’s concert. Benjamin Britten gives his name to tonight’s orchestra and Pierre-Laurent Aimard is the artistic director of the festival Britten founded at Aldeburgh here in East Anglia. In the speech that he gave when accepting the Aspen Award in the Humanities in 1964 Britten set out his vision of a holy triangle of composer, performer and listener. Today, particularly in modern music, that holy triangle sometimes becomes a profane duo of composer and performer, with the listener left as a bemused spectator on the touch-line. My objective with tonight's event is to make sure that you the listener are firmly located at the apex of Britten’s holy triangle, and to do that I will be asking Pierre-Laurent and Tamara to include you in the Dialogues by tuning your ears to Elliott Carter’s unique and rewarding sound world. It is very easy to set the bar too high at events like this. We are very fortunate to be hearing the music of Elliott Carter in Norwich, but we must also remember that for many in tonight’s audience this will be the first time they have heard Carter’s music in a concert hall. Indeed for some it may be their first ever hearing of his music. ‘One thing I can’t understand is why people have such trouble with modern music. It seems to me to be perfectly intelligible. When I hear one of my pieces again, or listen to the record, I don’t see why people could find this perplexing in any way. Yet audiences can’t make head or tail of it’. 'I finally said the hell with that whole point of view and decided to write what I really always hoped to write, and what I thought was most important for me. I’ve taken that point of view ever since. What Elliott Carter always wanted to write was music that was cerebral as opposed to emotional. Just as it is more difficult to read someone’s thoughts than their emotions, so it is more difficult to understand music that is cerebral rather than emotional. Elliott Carter’s music is also atonal, which means the familiar reassurance of a tonic key is absent. But please do not be too frightened by all this. In many ways Elliott Carter was a radical traditionalist. He rejected the unpredictability pursued by John Cage and his peers, and Carter’s masterpieces conform to the traditional concept of a work of art. This means that, unlike Boulez and Stockhausen, Elliott Carter has written, for instance, a Violin Concerto with a conventional three movement structure. I have described Elliott Carter as a radical traditionalist. He has always considered himself to be an American composer. 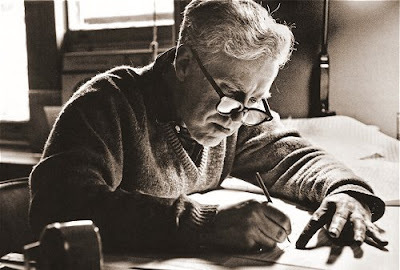 He was born in New York in December 1908 of wealthy parents and studied at Harvard where, rather surprisingly, one of his teachers was our own Gustav Holst. Carter’s music benefitted from being championed in Europe in the 1950s by the American Congress for Cultural Freedom, an organisation that was later found to be CIA funded. This was my introduction to last night's Britten Sinfonia event before their concert of Haydn, Eliott Carter and Mozart in Norwich. The programme of recessional music proved that if you have faith the crowd will follow you, and 43 minutes of Carter's music attracted an audience of 400; although for a university city with a high-profile music department there were disappointingly few young faces among them. Lots of young faces in the band though, but my wife did observe that Elliott Carter's music is clearly more masculine than Osvaldo Golijov's as the female/male ratio among the musicians swung from 80/20 at the recent Britten Sinfonia Eight Seasons concert to 64/36 for Elliott Carter. There was a fascinating example of old meets new in Carter's Inner Song for solo oboe; Nicholas Daniel used a high-tech digital music stand from MusicReader, but needed a human page turner to push the buttons. Speaking of technology, I have previously written in praise of the Theatre Royal Norwich's CARMEN® digital sound enhancement system. But there was an unfortunate intermittent low frequency intrusion at last night's concert; was it a malfunction in the technology? But just a minor reservation, and the music and performance were gorgeous with Pierre-Laurent Aimard and Tamara Stefanovich behaving like angels in the pre-concert event. The London performance of the Haydn, Elliott Carter and Mozart programme tonight (Nov 7) is being recorded for later broadcast by BBC Radio 3. There is a further performance in Cambridge on Nov 9. This is the future of classical music. * Listen to a podcast of my discussion with Pierre-Laurent Aimard and Tamara Stefanovich here. * Elliott Carter - A Centennial Portrait in Letters and Documents published jointly by the Paul Sacher Foundation and Boydell Press. 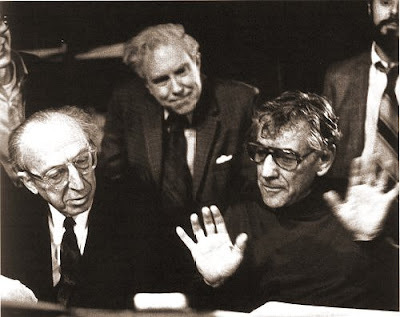 My header image, which shows Elliott Carter with Aaron Copland and Leonard Bernstein at the recording of Carter's Concerto for Orchestra in New York's Philharmonic Hall in 1970 comes from this inspirational book, as does the lower image. * A Concise History of Western Music by Paul Griffiths, who was librettist for Carter's 1999 opera What Next? * Stephen Heinemann's excellent sleeve notes for the CD Early Chamber Music of Elliott Carter on Cedille Records. The low frequency rumble was unfortunately caused by an intermittent problem in the air conditioning unit. It is not caused by the Carmen system but is made a little more audible when it is turned on. Good news - the 30 minute pre-concert talk with Pierre-Laurent Aimard and Tamara Stefanovich was recorded, and the artist's agent has cleared it for use as a podcast. I will flag it up as soon as soon as I have a copy and it is uploaded to my iTunes podcast site.